Do you ever have a hard time letting go of an idea? Reptiles seem to have a place in our family. My son has had a Leopard Gecko since he was nine years old, and, since moving away, taking the gecko with him, has expanded his small personal menagerie to include a Blue Tongued Skink, which was a rescue, and a Peters’ Banded Skink, a species he became quickly attached to. In fact, long-term, he’s considering very seriously joining or starting a species recovery program for the species. It’s native, if I’m remembering right, to the grasslands just south of the Sahara and has had an awful lot of habitat loss in the last couple of decades, so it doesn’t have a single continuous range anymore. My daughter has kept the corn snake for a pet since she was nine years old. She has, several times, talk about wanting another snake, or a second corn snake to perhaps even. They’re not so endangered, but it comes from a similar impulse. Now, whether those two impulses are lurking somewhere in the back of my brain, whether I’ve internalized them because they’re coming from my children, or if it’s a completely original idea to me, I had the brilliant thought not to long ago of participating in a species recovery program for something a little more local, but also something a little more serpent-y. 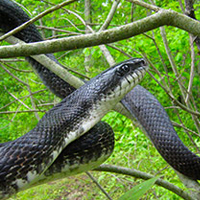 The Grey Rat Snake has, barely, a population in the region, mostly focused on the Frontenac Axis. My thought is that it’s not that hard to incubate eggs, so long as you are able to control the temperature and humidity appropriately for the species in question. My father has done chickens, ducks, and geese any number of times over the last several decades. I can learn the basic skill set from him. I can learn the basic knowledge of what conditions need to be and what the dietary requirements of hatchlings are with a relatively small amounts of online research, and the environment and conditions they need will take some more study time, although possibly not as much as figuring out the requirements and regulations in Ontario, having a little experience with how murky government websites are. After that, it’s just permissions, right? Permissions to set up or join a species recovery program, permissions to keep native animals, not as pets, but as part of that program. Permissions from my wife to actually do this, because she’s not all that keen on snakes. That might be the most important permission, really, as we’d want to keep them for a year or so, getting them above the initial delicious fresh out of the egg size so they have a better chance of actually surviving in the wild. Worth noting that there is also a species of turtle that’s fairly local to the area and is in similarly fragile state species-wise, Blanding’s Turtle. I think this would be really cool long-term project, and really interesting to do. Plus, it would let me give a little something back to the planet that’s give me everything. But I don’t think it will be smart to start until sometime after we move and are established in the new house, you know, the one I’m going to retire in, but once we’re there… that’s a whole new sport.